Did This Little Election Strike a Big Blow to Education Reform? Progressives and unions say a primary in Connecticut last week shows momentum is turning against the corporate-backed charter-school movement. 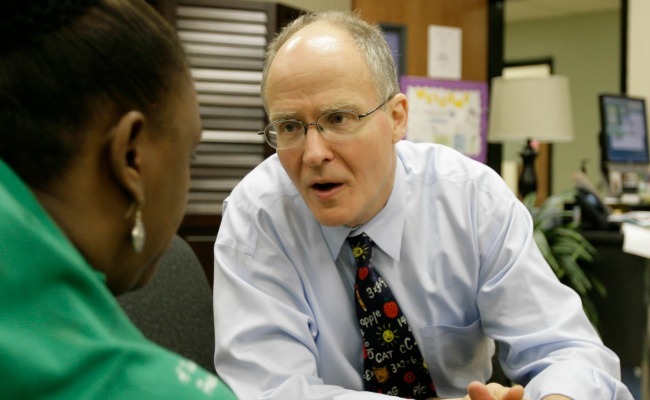 In the world of education reform, Paul Vallas is a superstar. As leader of school districts in Chicago and Philadelphia, he expanded charter schools and testing. In the wake of Hurricane Katrina, he replaced New Orleans’ ravaged public schools with a radical experiment in decentralized, charter-based learning. President Obama’s education secretary, Arne Duncan, has hailed him as an innovator. And yet a tiny, little-noticed municipal election in Connecticut last week may have been his undoing -- and a major setback for the self-styled reform movement he champions, which increasingly faces tough political fights after years of ascendance nationally. The results in Bridgeport, Vallas's opponents claim, are proof that communities are mobilizing to defeat the reformers. For the past two years, Vallas has served as the controversial superintendent of schools in Bridgeport, Connecticut, a depressed post-industrial shipping town that is the state's largest city. Last Tuesday, three Vallas-supporting school-board members were trounced in the city’s Democratic primaries. Vallas’s opponents -- liberals, labor unions, and angry public-school parents -- are calling it no less than a repudiation of his philosophy. And Vallas is likely to lose his job as a result. The Bridgeport primaries were the latest front in the ongoing political war over American education. It’s a fight that has become intensely polarized, with reformers like Vallas and Michelle Rhee vilified by progressives and unions who see them as working to privatize public schools and undermine teacher unions. Vallas's opponents say he has a record of closing schools, laying off teachers, privatizing school management, raiding pension funds, and funneling taxpayer dollars to for-profit education companies with dubious track records. Vallas says that in Bridgeport, he has not closed a single school, opened a single charter, or laid off a single teacher. The Vallas allies who lost last week were Democrats endorsed by the state Democratic Party and town Democratic committee and backed by the mayor. In a nearly 10-to-1 Democratic city, the primary winners are all but guaranteed to win the November elections and team up with Working Families Party members to form an anti-Vallas majority on the nine-member school board. The new board members are determined to oust Vallas, Farrell told me, and begin searching for a new superintendent. They plan to undo Vallas’s reforms, including increased student testing, high-priced consultant contracts, and cuts to special education and electives. The schools fight in Bridgeport actually predates Vallas; he was hired as part of a school-reform push by the state's Democratic elites. In 2011, after the Working Families Party won a minority of school-board seats and started using them to challenge the establishment, the state responded by eliminating the elected Bridgeport school board altogether. It was replaced with a board of mayoral appointees that hired Vallas. The state Supreme Court ruled that eliminating the elected board was unconstitutional. So reformers took their cause to the ballot instead, asking the citizens of Bridgeport in a referendum last November to approve the elimination of board elections. The initiative had big money behind it, including nearly $200,000 from Rhee’s Students First and $25,000 from New York Mayor Mike Bloomberg. But opponents painted it as an undemocratic power grab, and it failed by a two-to-one margin. Meanwhile, the reform opponents have made steady gains in board elections, which are held in odd-numbered years. Connecticut’s complicated rules reserve three board seats for a minority party; once pro-Vallas Republicans, all three are now anti-Vallas Working Families Party members. Together with the three anti-Vallas Democrats who won last week’s primaries, they will constitute a 6-3 majority if nothing unexpected happens in November. For the Working Families Party, a liberal, union-based coalition active mainly in New York and Connecticut, the hope is that last week's victory is a sign of things to come. The education-reform movement remains beloved of corporate interests, hedge funds, and centrist beacons like Bloomberg, former Florida Governor Jeb Bush, and Newark Mayor and New Jersey senator-in-waiting Cory Booker. But it’s come under attack in increasingly acrimonious policy fights across the country. Unions’ attempts to reverse what they see as Vallas’s privatization of the New Orleans schools have failed. In Denver, a district once run by now-Senator Michael Bennet (the brother of Atlantic Editor in Chief James Bennet), reformers have beat back several waves of well-funded union challenges. On the other hand, unions have flipped school boards in San Diego and Washington, and were seen as the winners of last year’s Chicago teacher strike.